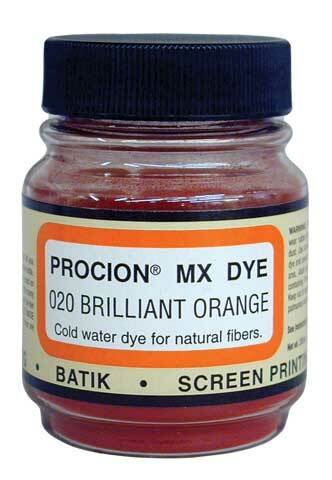 Procion is a concentrated powdered dye which, when added to water, produces exceptionally brilliant color. The dyes are intermixable, and the resulting colors are permanent, colorfast and completely washable. It is ideal for all natural materials such as cotton, rayon, linen, silk, wool, paper, reeds and wood. Plus, it can be used for a variety of applications including tie-dyeing, vat dyeing, batik, airbrush, hand painting, printing and spatter painting. Available in 2/3 oz. jars. Generally, one jar can dye more than five yards of fabric- about nine T-shirts. Acid dyes, which are probably even better for protein fibers (such as silk, wool, cashmere, nylon, etc. ), are also available- call for details.